Discussion in 'Roller Coaster Construction' started by roomraider, Sep 15, 2015. 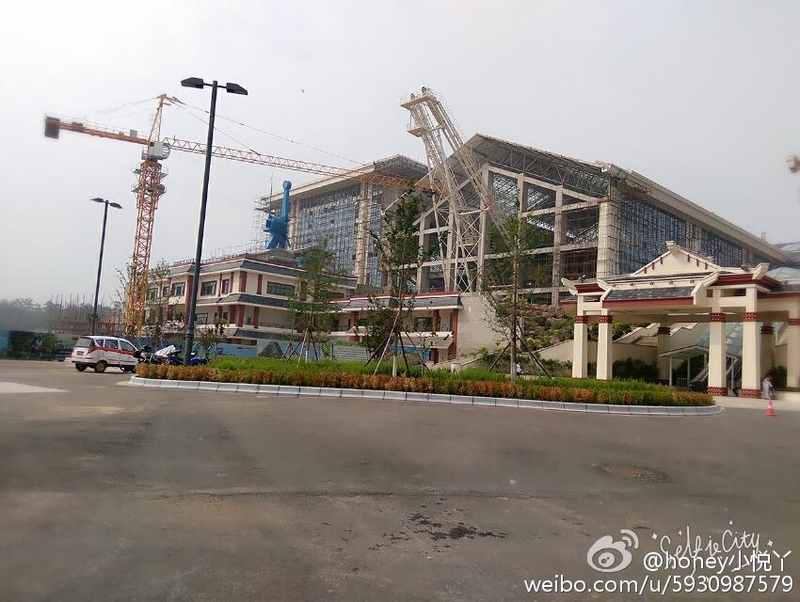 The new B&M wing coaster at Hotgo Park in Fushun China has gone vertical. From the images it looks like this is going to the second park which is on the flat area behind the current one with the Gravity Group woodie and has a massive hotel under construction. The existing park is built on a hill. The hotel, water park and huge empty area behind them are on flat ground below it. Cheers Gavin. Got that the wrong way round Fixed the original post. The new B&M wing coaster at Hotgo Park, China is going up nicely with a diving drop and loop in place already. Has anyone else noticed this wing coaster isn't listed on RCDB? ^It is, but not under 'Bolliger & Mabillard/Wing Coaster'. Vertical loop after a dive drop? Me like. Really like that start - nice change up of Dive Loop/Zero G.
So this will also have that roll over-turn thing that The Joker will have? Nice! This might give Thunderbird a run for it's money as the best wingrider! The roll at the end looks like an extended version of the final roll on Valravn. That looks like a really interesting layout, also, I don't know if it's the angle of the shots, but, it looks like B&M have refined their banking of their inversions, starting the banking to their Zero G Roll higher up the parabolic curve, meaning that there's chance of a slight bit of airtime before hitting the G's of the inversion - same with the final 'rollover' inversion or whatever it's called. I agree! Especially the 'rollover' inversion, that looks like it might have a really good pop of airtime going into it. No sign of the B&M hyper yet but strangely it appears they have built a Boomerang coaster sticking out the side of a building. Still working on confirming exactly which make of Boomerang it is but the ride itself appears to be at the soon to open Spa and Sports world rather than either of the Theme Parks. That's fab, I love it. You know what this Spa needs, a cred sticking out of it. For some reason I thought this was in a really awkward part of China, but it's 'only' five hours from Beijing on a train - might have to go on a list for the future then. ^ Shenyang is pretty far north, but fairly major. Flights from everywhere in China. I did it as a long weekend from Hong Kong very easily. You wouldn't be able to. Even though Shenyang is close to the border, you'd still have to do it through a tour group via Beijing. Not sure why, but North Korea don't seem keen on people just rocking up for creds.